I want to confirm that I was an eyewitness to the story below- IT IS TRUE! "My story begins back when I was in high school. I went to a small school called Briarwood Christian High and one of the neat things about the school is that is has a creek located behind it that separates the school parking lot from the athletic fields. I started fishing this creek back when I was in the 10th grade and did well. One day I caught a 5- and a 6-pound bass on two consecutive casts. For the next two years I still continued to catch fish, but it was my senior year that remains my most memorable. I was out fishing during school - I believe it was during fifth period accounting - when I got the urge to cast a line into "Briarwood Creek." I was not there for too long when I saw the biggest fish I had laid eyes on come over into a shallow area and sit there. I sight fished her for about 20 minutes when she finally took. The rod bent double and the drag started screaming and 15 minutes later I was proudly holding a 10.2-pound bass caught out of a creek used to drain all the athletic fields. 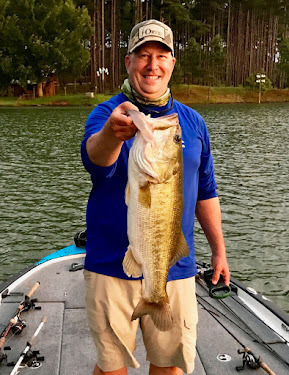 I took off running with the fish and jumped on top of my truck and signaled (it was more like a lot of hollering and screaming)for my long time fishing partner and football coach to come and see this fish. Coach Matthews saw me and saw the fish and came running across the football field with the entire seventh grade P.E. class and they all came to see this huge bass. After about 5 minutes, Coach said, "Austin we got to go show this fish to Coach Yancey." So after we got a cooler and some ice, we marched up to the school and into the lunch room to show Coach this fish. All the students were at lunch so when I walked in, totally out of dress code, and had a huge cooler on my shoulder, along with the entire seventh grade P.E. class, we obviously attracted a lot of attention. I proceeded to go to the teacher’s table and slammed this cooler down on the table where all of these teachers were dressed to the hilt in their suits and ties. A crowd of about 100 students started to gather around the table as I reached into the cooler. When I lifted this fish out, you would have thought I had won the Bassmaster Classic. People were screaming and hollering and clapping. Coach Yancey ran and got the headmaster of the school out of a meeting and brought him to see this fish. For the rest of the day I paraded that fish around the school in and out of classrooms showing what I had caught. When I saw my headmaster years later I asked him, "Why did you not give me detention for being out of dress code and fishing while in class?" He said, “If it had been smaller then I would have, but a person only catches a fish that big only once in his life."